At the turn of the 20th century (1900) many company's made advertising pieces. Punch Cigars picked Punch from Punch and Judy puppets to make a bank. The little Punch is standing on a metal box, he's holding in his fist a hand full of cigars. In front of his feet, on the box, is a slot for the coins to be dropped in. To give this item more appeal to children, they placed wheels on the box and fixed a small link chain to the back of the box. Now children had a pull toy to play with and could pull it from room to room. On the front of this metal box, in raised letters, is the name Punch. Each side of the box, in raised letters, it says "Five Cent Cigars". This is truly a well done cast iron piece. The casting has very smooth edges and is in no way crudely done. Punch has big ears and a big nose, and this mischievous silly little grin on his face, and big happy brown eyes. Easy to see why children would have been attracted to this bank. In keeping with our policy to make customers happy, we have found two others sites that sell this item. Some customers think that because we sell product for less money that the items are cheap, and will only buy expensive items. Below are two links to other sites selling Old Punch here. One sells this item for $46.00 and the other one sells it for $25.00. If you prefer to pay more but would still rather shop here, in the comments section of the check out you can tell us which of the more expensive prices you would prefer to pay (OR NOT :-). Choose Punch 1 or choose Punch 2 these open in their own window. 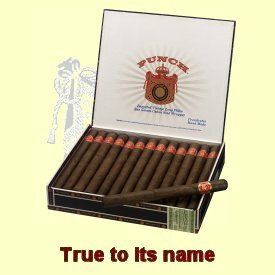 Punch cigars are still available today, below is one of their newer ads. Purchase your piece of advertising history today, it will look good on your desk or on your book shelf, give as a gift or buy it for yourself. 12 1/4" tall, across the front, outside of wheel to outside of wheel is 4 1/4". Painted in antique styling to give it an aged look.